An ERP system is your information backbone and reaches into all areas of your business and value chain. Replacing it can open unlimited business opportunities. The cornerstone of this effort is finding the right partner and specialist. 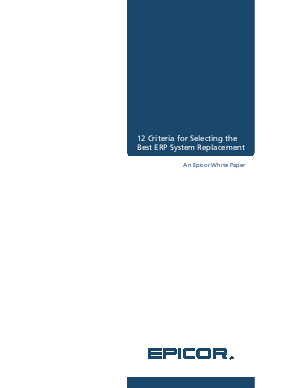 Your long-term business strategy will form the basis of the criteria for your selection of an ERP system replacement. Your ERP provider must be part of your vision. It is the duty of your software provider to do their part to make sure your next system will be your last ERP system replacement. This white paper explains the 12 criteria that allow you to identify and select the solution that will meet these expectations.